Well, 2012 has started off with a bang! To start off with, some of my recipes on how to cook winter vegetables with an Indian twist have been featured on the website Cooks United. If you haven't already, check out this interesting recipe sharing website. Not only does it have an impressive list of interesting recipes, but also a lively discussion forum where you can ask and answer questions about cooking and baking. Along with the forum and recipe collections, Cooks United also features a magazine section, with articles, features and tips on cooking for the season and techniques. You can sign up to interact with other like minded souls, or just browse through their collection of recipes, the dessert ones in particular are to die for. You can save, exchange and rate recipes as well. What more would a dedicated foodie want? Its only been a week or so, but the post I wrote about kids and restaurants has had several comments and has incited a really lively debate. I seem to have struck a nerve, particularly with parents, about the way in which kids are treated in restaurants. I wanted to confess that that particular post has been sitting in my drafts folder for a long time. It took a tweet from a fellow mum on Twitter about her experience at Ikea, to get me to hit publish on that post. I am quite glad I did, in a way. Its been cathartic, but also at the same time, has brought about several reactions from people that I didn't expect. Thank you to all those who took the time to read and engage with the post. I have every intention of responding to all the comments, but that will probably be another blog post in itself. And of course, I am hosting the Sweet Heat Chilli Challenge this month. The theme is Indian Food (of course!!) and the announcement is here. Please go ahead and link up your Indian recipes that use chilli (or are spicy) and lets all rock Indian! I am also going to be teaching another Cook Indian class with Kathryn from Get Cooking, and I am really excited about this one, as its going to be an all day class to truly mimic the way we Indians cook our food. If you are local and want to sign up for a day filled with some amazing food and cooking experiences, details are here. I am also going to be hosting another live blogging session, especially after that overwhelming response to the butter chicken. 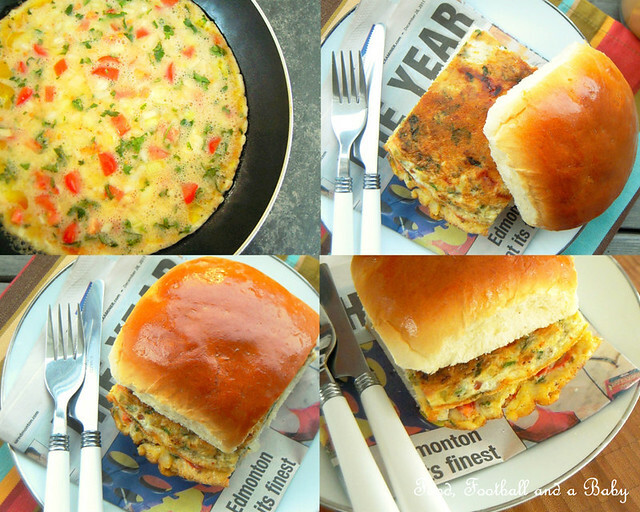 Time to kick off my first recipe post for 2012, then, with this spicy bun omelette. As anyone who has been to India knows, street food in India is something else. From bhel puri to gol gappe, and falooda to sugarcane juice, street food in India embraces every style of cooking and Indianises it. 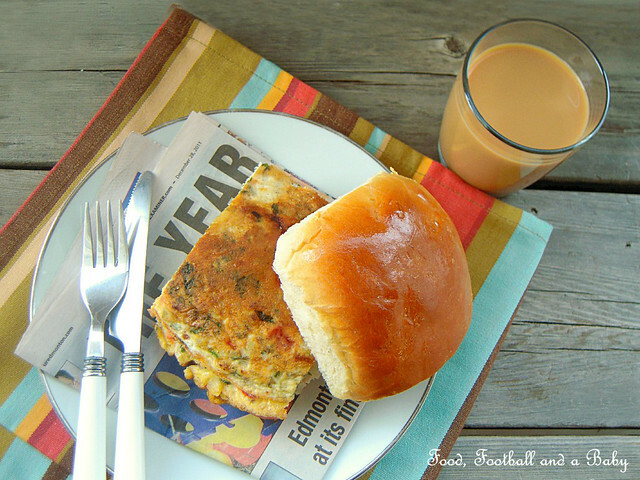 This spicy bun omelette is one of my very favourite... ahem... hangover meals! Some of the best memories that I have are of university in India. For the first time in my life, I was out of my house and into a hectic life filled with parties, political rallies, crazy discussions at 2 AM, tea, coffee... oh, and a little bit of studying too in between all those social engagements. Haha. I still have no idea how I managed to escape uni with a decent GPA the way I used to live there. We only had classes three days a week, and I made sure all of mine were in the afternoon, in order to facilitate my nocturnal lifestyle. Most nights found me hanging out at dhabas (street eateries) in the campus, debating everything from Karl Marx and Friedrich Engels to Barbara Cartland and Georgette Heyer (blush) Our little group of friends could talk for hours and hours, and we drank enough coffee and chai to keep all the tea and coffee estates in business. I was rarely in bed before 3 AM, and I still remember calling my poor mum at 5 AM, pretending I had just woken up, when in reality I hadn't even been to bed. Ah, the joys of student life! Soften active dry yeast in warm water. Combine milk, sugar, shortening and salt. Cool. Add 1 cup of the flour and beat well with a wooden spoon. Beat in softened yeast and egg. Gradually add remaining flour to form soft dough. Knead the dough until soft and pliable, then roll into a ball and place in a large bowl. Bake in moderate oven 375 degrees F for 17 - 22 minutes, until the rolls are golden. Note: If you have bread machine, just place all the ingredients into the bowl, then make a dough using the dough cycle. Take out the risen dough, shape rolls by hand, and let rise again. Bake as directed. Break the eggs into a large bowl. Whisk until well mixed. Add the chilly powder, ground coriander and cumin, garam masala and salt and pepper to taste. Whisk well. Add the diced onion, tomato, green chilly and chopped coriander. Mix well. Heat the oil in a large pan, then pour in the egg-masala mixture. Cook until just set on the bottom. Preheat your grill, then place the pan under the grill for a few minutes, until the top is set. Slide the cooked omelette on to a plate. In the same pan, place the sliced bun, slice side down and heat for a minute, until the bun is heated through. 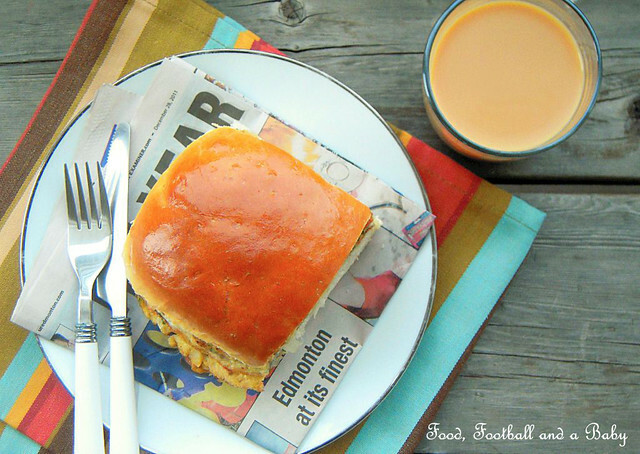 Serve the omelette on the bun, with a hot cup of chai. Note: An alternate way of making the omelette - Fry the onion in a litle oil, for about 2 - 3 minutes, until the rawness disappears. Add the diced tomato, green chilly, spices, salt and pepper. Fry for an additional 2 minutes. Add the fresh coriander and lightly beaten eggs. Stir together once, then cook the omelette until the bottom is just set and a very light brown. 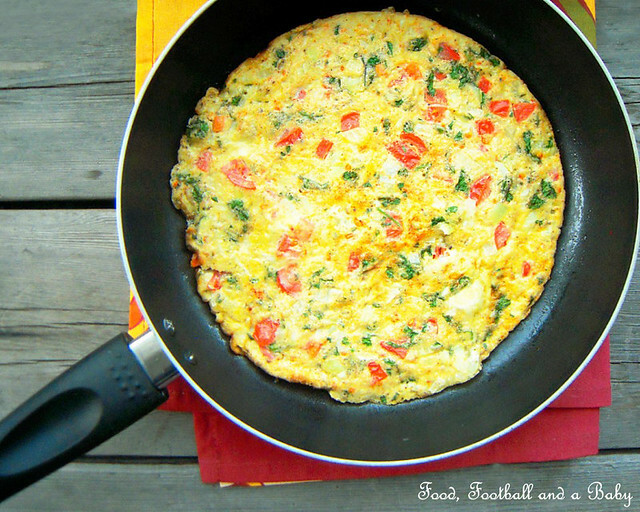 Flip the omelette over, and cook the other side for a few minutes. Serve on the fried bun, as above. Looks lovely:) Brings back memories! Totally making this. My memories of college and university are of eating pani puri, moongfali ( the roasted ones you get on carts.. heating up slowly under the little fire-pot)and of course chai and samosa!! It's so great that you have posted this recipe!! Yumm... I have to try that pav recipe. I would so much like to go to India one day to try all the lovely food. I'd never have thought of an omlette as being Indian but I love the spices in it and I'm surprised now that I was surprised!